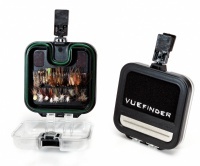 The Wychwood Vuefinder Fly Patch is a fly box you can wear! Keep the flies your most likely to use close to hand with this clip on fly box. Stores up to 38 flies, includes fast-attach magnetic fly holders, a hook sharpener and fleece fabric fly dryer. Clips to almost any clothing, swivels through 360* and can be opened one handed.